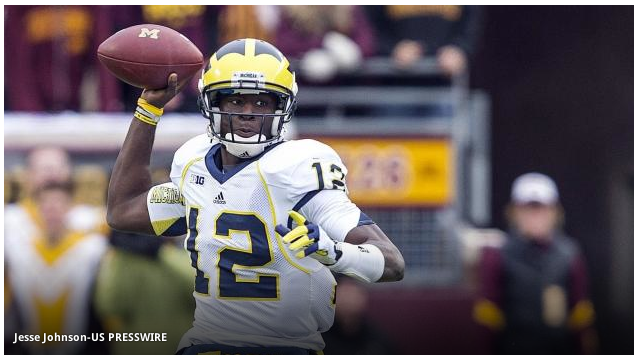 Brady Hoke made it official on Monday — Devin Gardner is a quarterback again. Yes, Gardner still will play wide receiver when Denard Robinson is healthy, but he's going to be practicing as a quarterback, serving as Robinson's backup and will go into 2013 as the anointed starter. He's even got a shot at 2014. 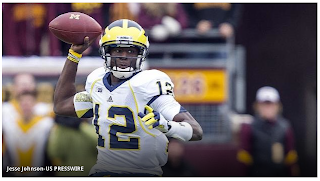 Gardner earned the return to his favorite position by leading Michigan to a 35-13 win at Minnesota on Saturday. With Robinson and Russell Bellomy sidelined by injury, Gardner threw for 234 and two touchdowns and ran for another. "I thought Devin did a nice job managing the offense and he did a great job extending some plays and making things happen," Hoke said. "He threw one pick, which he'd obviously like back, but he learned from that, took care of the football and did a nice job." Hoke said that it was always the plan for Gardner to go back to quarterback next season, but the timeline moved up with Robinson's elbow injury. That was the moment Gardner had been waiting for. He nearly won the starting job as a freshman, but Robinson was given the first chance because of his experience and never looked back. "We came out of camp even, but he got the start and took advantage of the opportunity," Gardner said. "He played the best game of his life against UConn, and then played another great game against Notre Dame." Since then, Gardner has waited patiently for a chance. He said that he never considered transferring and agreed to play receiver this year in order to help the team. As it turned out, he thinks that decision has helped him as a quarterback. "It is easier for receivers when the ball is in certain places, and you learn that when you are playing that spot," he said. "Yes, you still have to make tough catches, but if you can put the ball in a place where it turns a tough catch into a routine catch, that's better for everyone." Michigan ran a different offensive scheme with Gardner than it normally uses with Robinson, and Hoke acknowledged that will be a preview of the 2013 system. Gardner takes more snaps under center and uses a lot of roll-out passes, as opposed to Robinson's specialty of shotgun snaps and read-option draws. "All of the play action and outside stretch plays are because we were under center," Hoke said. "We don't do that as much with Denard because of the things he brings with the read play." Gardner enjoyed the changes, saying it was more like what he ran as a high-school star at Inkster (Mich.) High School. "Your instincts just take over," he said. "In high school, I rolled a lot and things like that, so I was comfortable. You can't worry about who's chasing you; you have to worry about what's going on downfield and how you can make a play." So, even with five-star recruit Shane Morris coming to Ann Arbor next fall, Gardner is a firm favorite to be Michigan's starting quarterback in 2013. The question now is about 2014. After narrowly missing out on the starting job as a freshman, Gardner injured his back and only played in three games. Although Hoke said that the Wolverines haven't begun the official process, they are expected to try to appeal for a retroactive redshirt for that season. If the appeal is successful, it would leave Gardner with two years of eligibility remaining. Gardner still might start Saturday against Northwestern, depending on the injury situation. Robinson is now practicing and "improving slowly," Hoke said, while Bellomy is sidelined with a mysterious injury. Hoke said he wouldn't comment on it, and he said that he didn't know if it would cost the freshman the rest of the season.